The CBZ-7 Bill's Sewing Machine Company is happy to introduce our new Apex CBZ-7RP with a new innovated puller to help insure flatter borders, which makes aligning stripes easier with more controllable adjustments; insuring superior quality.  Operator friendly, border width adjustments from one size to another.  Extra high needle rise assures easy sewing of all types of fabrics from light to heavy.  !!! NEW !!! A new innovative belt-driven puller with easier stitch length adjustments. Puller is equipped with right and left hand pressure adjustments to give a more consistent pull on different thicknesses of fabrics. 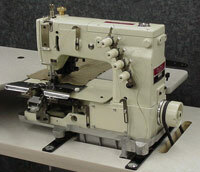  Machine is sold complete with stand, clutch motor and (1) folder of your choice.  Electronics are available to assist with operator handling and quality. 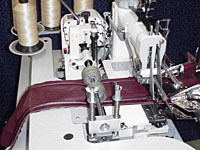 The DWK-2 Apex Double Welt Machine is a single-needle, chainstitch sewing machine which produces cleanly finished double welting with turned under edge. Built-in dual trimmers eliminate any necessity for accurate cutting of covers. Complete with two folders to accommodate any and all types of covers from thick to thin, including vinyls. Instant "drop-on" folder interchange. 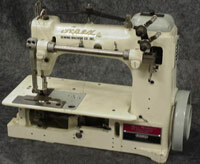 Features a new Heavy-duty transmission type puller to help feed heavier fabrics and now capable of sewing leather. Also machine is available with air vaccum system to help provide clean work and clean work area. 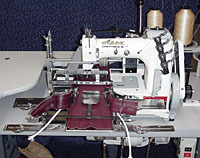 The Apex PK-1 is a single-needle, chainstitch machine for puckering a single ply of cover around cushion fronts and similar operations. Also for gathering one ply and simultaneously sewing a second ply cover. By folding, puckering can be done on either side of the stitch line. There is no facility for welt with this model. Simultanious sewing of seats to band. Automatic gathering around cushion fronts. The ZPR-HS high-speed zipper features an automatic lubricating systems allowing the machine to sew at a higher speed than the ZPR-2. 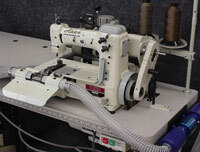 The Apex ZPR-HS is a two-needle, chainstitch machine with a top-driven puller system.